The Majestic Sedona is located in the heart of Sedona and close to everything. A short walk to the Uptown where the galleries, shops & restaurants are located. Just a small deposit to reserves your dates. 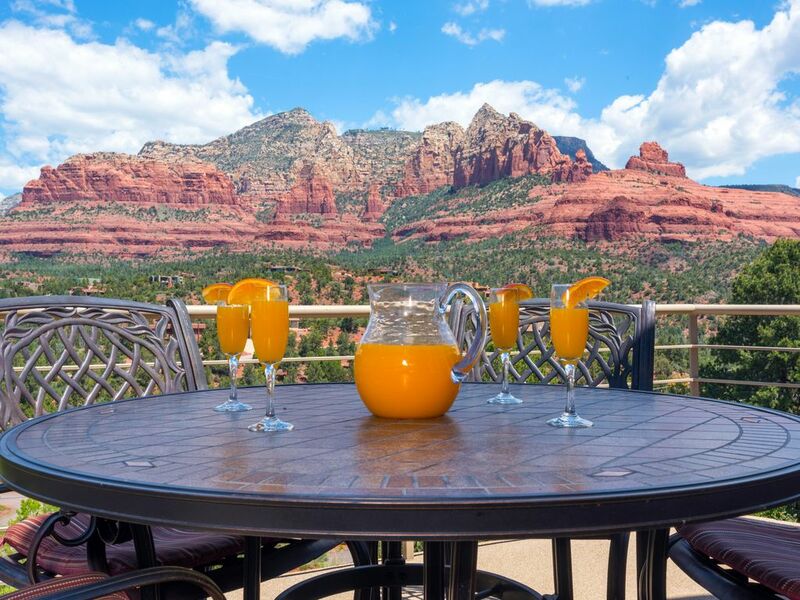 At our Majestic Sedona, one of our Red Sedona Vacation Rentals is this luxury single family, clean Non-Smoking, pet free house with an endless view of the Red Rocks and National Forest. Only a short walk to some of the best restaurants and shops in Arizona. After a brilliant sunset against the red rocks, enjoy the soft breeze and the expansive black sky with a billion stars! If you are looking for convenience, luxury and privacy this is the one. This romantic 2300 square foot, non-smoking floor plan consists of a master suite with king bed, TV, and private full bathroom. The second bedroom has a king bed, TV, private deck, and private full bath in a separate setting and TV. The fully-equipped kitchen has all the appliances and goodies for a gourmet' cook. There are two living areas with TV's. Just under two hours from the Grand Canyon and minutes from other popular attractions. With the popularity of vacation rentals, this is a great option. Concierge Service: When staying with us, we provide complimentary concierge service. Our concierge has great connections with many of the outfitters in the area, balloon rides, pink jeep tours, discounted tickets, adventures and excursions. Spa services, in home chef services and so much more. As soon as you reserve your dates, we email the concierge contact information so you can begin planning your ultimate stay. You can rejuvenate in plush serenity every night and wake up each morning refreshed and ready for the day now with our 'heavenly bedding'. We offer 5 luxury homes in Sedona ranging from 2 to 5 bedrooms at our Red Sedona Vacation Rentals. A short 10 minute walk to the "uptown" were the galleries, shops and restaurants are located. We offer indoor and outdoor dining. Flat screen TV's in bedrooms, lower living area and upper living area. Decks off of the front and back. Personal Concierge service, High Speed Cable Internet, 4 Cable TV's, Full Kitchen with Microwave, Cooking Utensils, Gas BBQ, Pack-n-play, high chair, Multiple Decks surrounded by breathtaking Red Rock Views!, Sedona, voted by USA WEEKEND most beautiful place in America!, This is a non-smoking home. Mountain View: Wilson Mountain Red Rocks. Deck/Patio. Private Hot Tub. This home was perfect for the 4 of us. Close to the uptown, however very private. We enjoyed the many hiking trails and returning to soak in the hot tub. Very clean and well stocked for our week. We will return. This house was very clean and the views were amazing from the hot tub and decks. There were two couples and we each had our own areas which makes it nice. Rob was very responsive and always available to answer any questions we had. The concierge service was very helpful with planing trips for us and we even used the private chef one night for dinner on the deck. We will be back. Clean, comfortable, well appointed... we enjoyed our stay and the views from the house are fabulous! Everything about this place exceeded our expectations; the views of the Red Rocks from each level of the condo, the cleanliness, location close to restaurants and shopping, and the well stocked appliances. We stayed with another couple and a bedroom on each of the 1st and 3rd floors afforded plenty of privacy. The hot tub provided welcome relief after a day of hiking. We would highly recommend the Majestic Sedona to anyone looking for the best of the best. NOTE our Cancelation terms: Refund 60 days prior to arrival, less $100 admin charge. After 60 days you forfeit the full amount unless unit is re-rented. Affordable trip insurance is available when reserving with us.